Summary From Goodreads: Waking up in a coffin hungry for blood is only the beginning for sixteen-year-old Ava Blue. When Chance Caldon, the hottie who dug her up, tells her that she’s half vampire, Ava’s world really turns upside down. So Ava sets out to get her life back. But killing vampires begins a battle that could destroy everything she is working toward. In the end, Ava’s decisions will forever change her life and the lives of those she loves. But redemption isn’t lost. 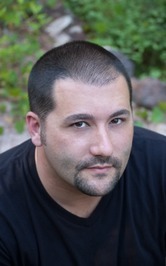 Aldric is giving her a chance to regain her humanity. The price? Kill a hundred vampires, or remain a bloodsucker forever. 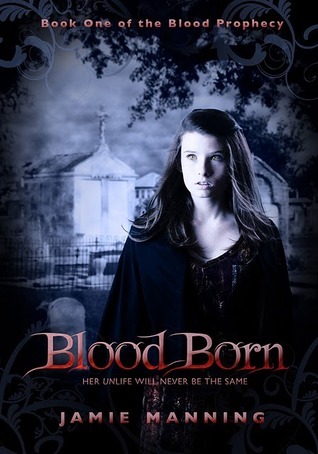 Heather’s Review: The first thing that gripped me about Blood Born is the quality of writing and the fascinating relationship between Ava Blue and her life saver Chance. The two have a chemistry that will keep you engaged and engrossed. I read the entire book in a day and a half! Well done for a paranormal debut Jamie. Avaline finds herself buried alive with no recollection of who she is, where she lived or who her family is. She has been reborn to the life of a hybrid vampire. The one person who is there with her from the first moment of rebirth is determined to stay by her side and protect her at all costs. Chance is a keeper, you will love him. The two are on a mission to keep Ava as human as possible and the only way to that is not pleasant. Ava has a lot to overcome and the odds are stacked against her 100 to 1. Add in her new goth friend, a set of twins and two very evil undead and you have quite the action packed thriller of a ride. I’m not going to lie, this book has some moments of vampire slaying and blood. So if you are queasy with the idea of scenes akin to the Lost Boys (movie of the 80’s) complete with wooden stakes and a clan of killers you might want to gear up for violence. Other than that there is mild swearing and one swoon worthy kiss and there is one heck of an ending that will leave you wanting book two. Author Bio: I’ve always wanted to be a writer (like most writers, I’m sure) but not until the last few years have I taken it seriously (after I read a tiny, unknown book called Twilight). I was always told growing up that I had to get a job and “earn my keep”, so I pushed my dream of writing a book to the back of my mind and entered the workforce. Fast-forward many, many years and here I am, trying to make a go at it. I stumbled across Blogger in 2010 and my world of writing exploded. I have met (via the web) so many amazing writers and industry professionals and book bloggers that have passed on their wisdom and experience and successes and failures. So many, in fact, that I have no excuse to sit down and write out the stories living in my head. Which is what I’m now attempting to do. Visit all the stops on the Blood Born Blog Tour for lots of giveaways! Our Giveaway: Author Jamie Manning is giving away five pieces of swag plus an ecopy of Blood Born to one of our readers! To enter to win fill out this form. Sounds good. Looking forward to reading it. Thanks for the interview and giveaway and trailer. The trailer is scary. I am still listening to the playlist on Refracted Light portion of the tour. I love following this book tour. I really want to read this book! I have to put this book on my TBR list. Can’t wait to read it. U have a very cute blog btw. I am glad I found it! I truly enjoyed ur review for this book. I am going off to check out sum more stuff on ur blog. THANK YOU FOR BEING A PART OF THE TOUR!!! my eyes are ready!! Cannot wait for this book!! I doubt I would have heard of this book if it wasn’t for the blog tour, so thanks for introducing me. SO many people are making it sound so awsome and interesting. When will it be my turn to read it? XD As soon as I get a copy from the library. XC So many people are rewuesting it too when it comes out. Words getting out about it apparently. Sounds amazing!! I can’t wait to read it!! I have heard so many good things about this book, and I am so excited! Great review! My daughter thinks the book sounds interesting…that is a high complement from my teenager! I am really looking forward to reading this book. Thanks for the tour! !